It's been just over a month since Google announced the end of Google Reader and Feedly is clearly in the lead to dominate the market. This news reader service has released a number of major updates in the past month, including one today that finally offers the Google Reader style reading experience that this hard-core news junky has been looking for. This update adds some bug fixes, better support for Hebrew and Farsi, and improved support for poor internet connections, but it also brings one hugely important change that is going to please a lot of news junkies. The iOS and android apps now have a new title view that I have been desperately wanting. Feedly is describing it as a "denser and cleaner title-only view" and compared to the previous list view or magazine style layouts it truly is dense. Speaking as an expert on reading, if you liked the dense info rich Google Reader layout then this is the replacement you want. This new title view is actually one step better than Google Reader. Seriously. One problem I always had with GR was that the titles were so densely packed that it was easy to miss an important story. It's not that I wasn't reading the titles as I scanned them, but that the layout was so dense that it was easy to skip a line and not realize it. 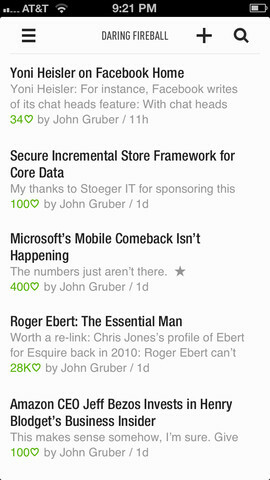 This new title view on Feedly fixes that problem by added a short blurb to each title. This costs a little bit of screen real estate but it also adds a useful spacer. Do you know what? This is something Google should have added years ago, if only they had cared to put any work into Google Reader. In my opinion this moves Feedly far ahead of the other 6 possible Google Reader alternatives. On a related note, it is also possible to make Feedly look more like Google Reader in the browser as well, so right now all I need before I completely give up on GR is a way to translate non-English feeds. Feedly is also coming up short in the search dept; you can search for feeds that you want to subscribe to but you cannot search the feeds that you are already following. That can be a problem for those of us that want to find stories we had read weeks ago but didn't think to save. Have you found a good replacement for Google Reader? Rumor: Did B&N Pass on a Chance to Make a 6.8″ Nook Glow HD? rather amazed to see that feedly is a free app. How do these kinds of services ever make money? I’m not really sure. I know some companies that have free apps also do paid custom work in the same niche. The Play store version of Feedly hasn’t been updated since 4-09. I have too many problems with that version that I can’t figure out. First the font on the article list is way too small and it’s too difficult to read the gray text on either the light or dark theme. I have the article font size set to extra large, but it’s tiny and looks like its giving me the web page. I also want to read offline and don’t see where that’s possible. I have been using FeedMe and so far I really like it. Offline reading works great and you can set a specific font size number instead of small, large, etc. The sync is pretty quick too. I would love it if Feedly could search my feed! I was skimming through Google Reader, clicked “read” on just about everything, and realized I saw the word Feedly, found this post and ended up here to comment. Are there any readers out there that are good with the searching? 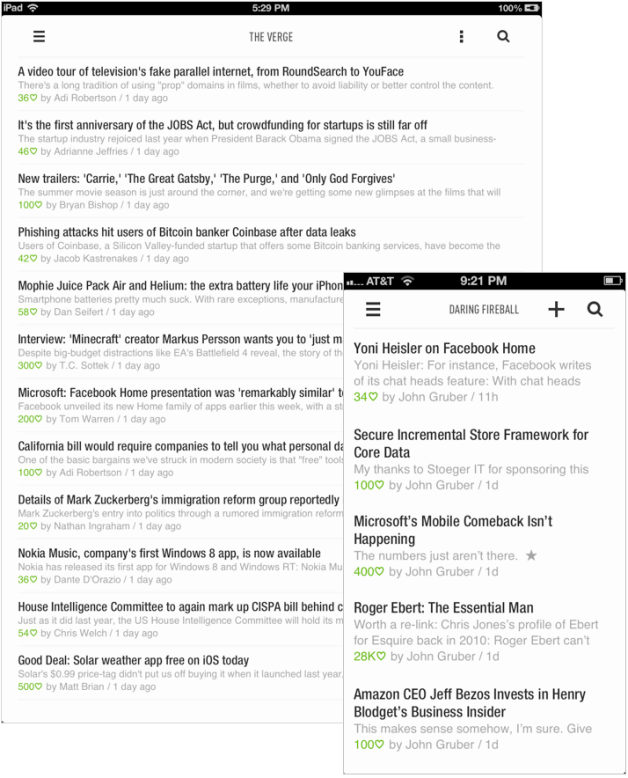 I disliked Feedly at first, but it’s growing on me. By the time GReader gives up the ghost, a couple of months from now, I’ll have weaned myself from it. Re how does Feedly make money. Maybe they’re hoping to be acquired by someone. A lovely free service often gets acquired just when you’re used to it — Tweetie, Posterous, Sparrow for Gmail — then is closed down. I’m switching between Reeder and Feedly on my iPad at the moment. Reeder has promised that it won’t close down with GReader. I think feedly decided to focus on ios, bcause the android version is not that good. I’m trying 2 good services now and . I think all of themwill come with some kind of premium service. I have read more positive post regarding Feedly since it has a better solution for us reader, and since it was a free apps, I hope no bugs at all..
Have been using Feedly for a few weeks and like it. However they ‘broke’ the Today tab (or whatever it is called), first on Android and then on iOS: one used to be able to ‘mark all as read’ when you got to the bottom of the list; now you cannot. That makes Today worthless to me since I read perhaps 5-10% of the articles and want to ignore the rest. The workaround is to visit each category/folder in turn, marking each ‘read’ as you reach the end. I’m baffled as to why they would have changed it as it worked perfectly before, and the current functionality seems, well, not very functional. Yet several updates have failed to restore the previous functionality. I’m starting to think I need to check out another option. I still haven’t found a replacement. Feedly on my Droid doesn’t seem to allow me to read headlines organized by publisher. I want to start with my local papers before WSJ. I have’t confirmed integration with the browser, but what made GR great was it didn’t matter if I used the browser or my droid–both knew what I had read and what I didn’t. Still looking for that feature.